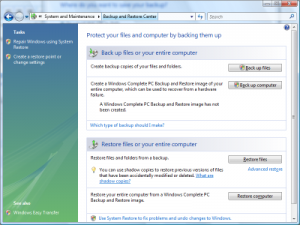 Windows Vista (excluding Windows Vista Starter and Windows Vista Home Basic) has the ability to back up files, folders or the entire computer, via the Back Up and Restore Center. To open the Back Up and Restore Center, open Control Panel > System and Maintenance > Backup and Restore Center. 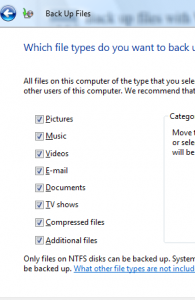 To back up files, click on Back up Files, choose the backup destination, then click on Next. On the next screen, select the type of files to back up, then click on Next. 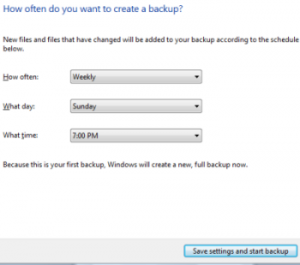 On the next screen, configure how often to do the backup, then click on "Save settings and start backup".